My wife Kit and I were disappointed when, after installing a rain gauge just 8 feet outside our kitchen window, we couldn’t discern the rainfall amounts on the gauge from that distance. Each reading required a trip outside. We decided to add some kind of dry substance that could add color – for us it was a pinch of Grape Koolaid powder – to the bottom of the gauge when the gauge was dry. Some days later (this was a month ago) we got a two-inch rain and you can see the results – this photo was taken from our kitchen window. Works wonderfully. Well, no chickens. 🙂 But a nice image. 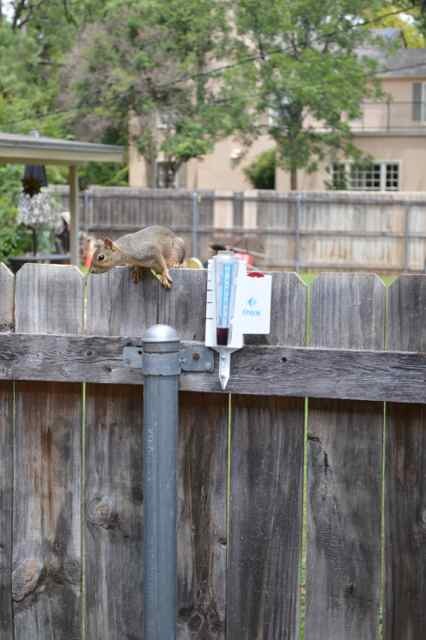 Here’s a shot of another rain gauge reading – smaller rainfall – with squirrel. Squirrel beside our rain gauge that held a tiny pinch of grape Koolaid powder to make the rainfall reading show up better. Try it – it works!